Christmas Day for the rest of us was celebrated in the Kingdom of Saudi Arabia with the inauguration of the massive King Abdullah Petroleum Studies and Research Center’s (KAPSARC) 3.5 megawatt solar energy field in Riyadh by Saudi Aramco President and CEO Khalid A. Al-Falih. The massive energy field stretches out over an area of 55,000 square metres and is currently the biggest ground-mounted solar installation connected to the grid in the whole Kingdom. The solar field is using 12,684 fixed-angle Polycrystalline PV panels provided by Suntech, one of the world’s largest producers of solar panels. The field will provide 5,800 megawatt hours of renewable energy fed into the electric grid, and offset approximately 4,900 tonnes of carbon every year. The initiation of KAPSARC’s solar field comes hot on the heels of a variety of other announcements made by the renewable industry in Saudi Arabia. Taking a trip back almost a year and Saudi Arabia was already being billed as the next solar market hotspot. Wind the clock forward by ten months and one of the state’s main spokesmen, Prince Turki Al Faisal Al Saud, said that he was hoping that Saudi Arabia would be powered completely by low-carbon energy within his lifetime. Push forward yet another month and Saudi Arabia announced plans to invest $109 billion into solar energy and planned to generate at least a third of its electricity from solar by 2032. The country has come a long way, considering their amazingly rich fuel reserves, and any push towards a renewable future is good news for a country so dependent upon fossil fuels. Saudi Aramco President and CEO Khalid A. Al-Falih inaugurated the King Abdullah Petroleum Studies and Research Center’s (KAPSARC) 3.5 megawatt solar energy field in Riyadh on Dec. 25, 2012. 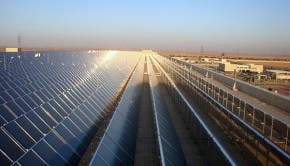 The solar energy field was built over an area of 55,000 square meters and is currently recognized as the biggest ground-mounted solar installation connected to the electricity grid in the Kingdom. The solar energy field will feed-in the center loads and electricity grid by about 5,800 megawatt hours of electrical energy annually. The field uses 12,684 fixed-angle Polycrystalline PV panels provided by Suntech with 14.4 percent efficiency and maximum power of 280 watts at standard test conditions. The DC power generated by the panels is collected and inverted to AC power through four inverters. The 5,800 MWH amount of renewable energy will enable the KAPSARC facility to achieve the platinum LEED certificate. The field will offset carbon (CO2) emissions by about 4,900 tons every year. The whole process of generating the solar energy field and connecting it to the grid is continuously monitored to analyze the data and measure the production efficiency. The inauguration was attended by Fahad E. Al-Helal, Saudi Aramco Project Management executive director; Dr. Mohammed Al-Saggaf, president of KAPSARC; Moatz Al-Mashouk, Saudi Aramco Public Service Project general manager; and delegates from Saudi Aramco Power Systems in addition to the project team.